I love Des Moines. I love people from Des Moines too. Some of them have sent me really nice emails about my quickie post yesterday on the East Village. Honestly, I set out to write a city guide featuring all my favorite spots. But the one that was posted on the design*sponge blog was so thorough and done so well, it wasn’t necessary. I still wanted to post my pictures of the neighborhood though. I’m such a fan of Jennifer’s store eden, and have wanted to blog about it for a long time. There’s always something new to see in town. We had so much fun that day, laughing at the t-shirts in Smash, and soaking up the colors in the sun-drenched From Our Hands gallery. So, you fellow Des Moines fans, I’d love to share some more thoughts with you, since you visited my hastily written post. You deserve better. I grew up in Carroll; so going to Des Moines in the early 60s was major. The escalator at Younkers downtown was a miracle. And there was a bookstore awaiting you after the ride on Iowa’s first set of electric stairs! A bookstore in a department store – where I once bought a travel poster from Holland to hang on my bedroom wall, making me as cosmopolitan as the girls I studied in Seventeen magazine. 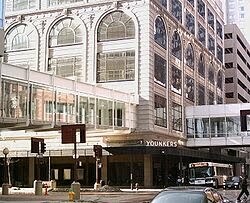 Some of the same brands in the shopping directory in Seventeen were carried by Younkers. Seeing Bobbie Brooks or Pandora labels in person was my version of a celebrity sighting. When the downtown store closed in 2005, I was so sad that I couldn’t bear to go to the sale of store fixtures. How I regret that now. 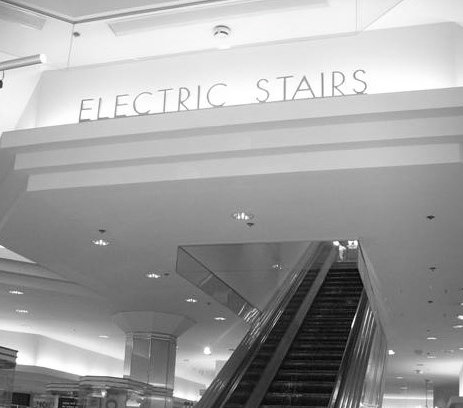 It could have been me on the front page of the Des Moines Register, quietly exiting with the fabulous “Electric Stairs” sign in tow. The woman who got it said she just walked right up to it and took it down, with no competition. I long now for even a teacup from the tea room. I like to search the web for memories of Des Moines that match mine. If you do too, check out this site featuring midwestern discount stores of the 60s. This person is waaaaaaay into remembering. Could the topic be any more specific? You gotta love it though. 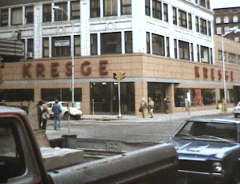 Great photos like the Kresge’s on the corner downtown. The first time my mom took my brother and me to the State Fair, we somehow ended up on the channel 8 news, interviewed by Russ Van Dyke. We went to a taping of Floppy. I ate my first McDonald’s hamburger that day. I marveled at the magic of pre-applied condiments. Another visit took us to the Cowles (or was it Cole’s?) Furniture store. We had to go there. Who wouldn’t want to? 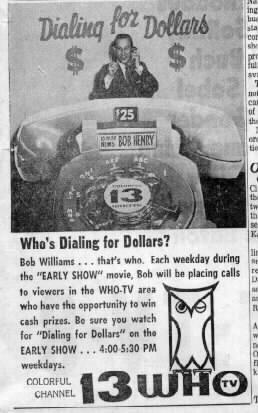 Every day during Bob Williams’ Dialing for Dollars TV show, an ad told us if we came there, we’d get a button that said “Just Browsing” and no clerks would bother us. How great is this? I wish I still had one of those. I’d wear it everywhere. I cannot find one person who remembers this, and not a word about it on the internet. I cannot remember if it was Cole’s or Cowles, like the media company. Please tell me you remember, someone. 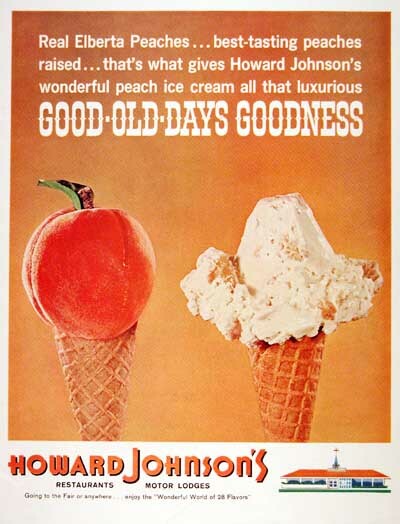 After just browsing, we stopped at the Howard Johnson Motel restaurant to have their fabled peach ice cream. 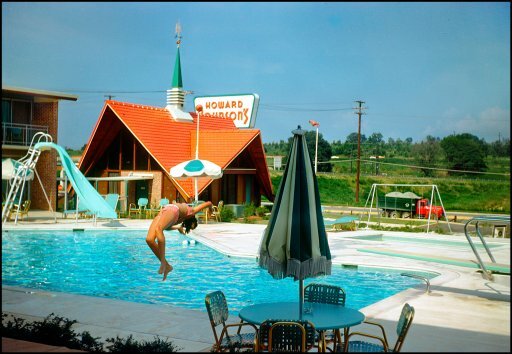 This was the first time I ever saw a motel swimming pool. We certainly didn’t have these in Carroll. The very idea was cool on so many levels. I sat eating my ice cream, wondering where these kids splashing in the pool were from; surely they knew many things I didn’t. Des Moines no doubt seemed like small potatoes to them, if they were cool enough to travel so far that an overnight stay was required. Whoa. So…I could go on. Des Moines was a brass ring to me growing up. I listened to KIOA all the time pretending it was my hometown station. Hours of my life were logged at Merle Hay Mall back when it was the mall in Iowa, accept no substitutes. No Ft. Dodge or Ames for me, thanks. Country Cobbler shoes or nuttin. I headed off to Iowa City for college in the 70s to become completely all-knowing. Des Moines was still there, but paleeeze, I had bigger fish to fry. Headed to Minneapolis after college and stayed for 20 years. Travelled to lotsa big cities, thanks. Funny thing, I ended up back in Iowa. My husband and I decided to explore Des Moines one day about five years ago. I hadn’t been there for a long time. We loved it. We had lunch at the Drunken Goat and shopped at the stores in that area. We drove around and marveled at the great houses and diverse neighborhoods. I loved it that the Fleur Cinema was still there, but sad that not much else of that area was the same. We went back many times, wandering through downtown, the East Village, the Drake neighborhood, Waveland, Valley Junction, every nook and cranny we could find. Sherman Hill enchanted us, we felt like we were in a Chicago neighborhood as we strolled the streets there. Beaverdale charmed us too. And the Art Center? Don’t get me started. It’s my favorite museum anywhere, and I’m a museum junkie. 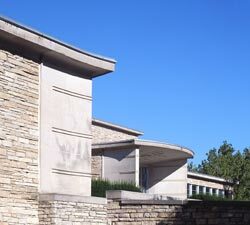 I love the story of the Des Moines Fine Art Association, and how the museum came about. I love the location of it, and the fantastic way it sits on Grand Avenue, all nonchalant with its Eliel Saarinen, I.M. Pei, and Richard Meier architecture. One summer day we visited the museum, and then shopped at the outstanding museum gift shop within, where I bought some handmade earrings and a bracelet made by local artists. We then went to grab a bite in the café. I told our cute waitress that I was impressed by the jewelry in the shop. She told me she made some of it, and of course it turned out she made the very bracelet I bought. I now have such a nice memory of that day when I wear it. Again, I could go on. So much to say about the city’s publishing tradition, Vets Auditorium, the neighborhoods, Terrace Hill, the downtown library, the eating places like Babe’s, the mid-century architecture, much more. Eventually, we planned to move there, to a downtown loft. The city had everything we wanted, and was constantly growing and changing. But then he unexpectedly got a job that required a move to eastern Iowa, to Cedar Rapids. Ok, well, that’s a big town too, it’ll be ok. Ok. Surprise, surprise surprise. Cedar Rapids and Des Moines are quite different. We noticed this right away when we went downtown in CR on a Saturday morning expecting to have some coffee and a long walk. People don’t really do that here. There are quite a few things people don’t really do here that they do in Des Moines. That would be another topic for another post. I’m not bashing CR, it’s just not the same kind of progressive, hip, vibrant, and friendly place I’ve always found DM to be. I have a history there, and it never fails me. It never fails itself. It’s one city that’s very aware of its past, and honors it while moving forward in the best possible ways. Bravo, capital city of Iowa. Thank you. I have both felt amused, very happy a little nostalgic, at times even sad. Writing this I´m swollowing tears, because something moved me tremendesly whjilst reading. You are such a fantastic writer. I have added Des Moines to my list of MUST VISIT places. I´d love to hear someone read this text aloud. So please, please, plese go on. I really am in love with your words. Good timing! 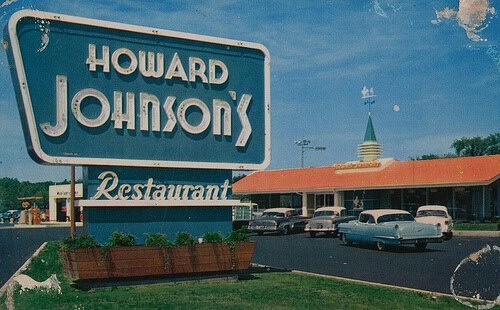 I had a flash a couple days ago where I remembered a family vacation where we stayed at a Howard Johnson. I had hours of fun swimming in their pool. Seeing the photos brought me joy. Thanks! “Just Browsing” at Cole Furniture and Carpets Marlin F Cole, my father. I ran the store for several years and still in custom furniture business in Scottsdale Az. Santa Fe Saavy.